AcadiaChamber Press: Welcome to New Member Chimani, Inc.! Welcome to New Chamber Member, Chimani, Inc.! Chimani, Inc was founded by Kerry Gallivan and Shaun Meredith, in January 2010. The concept was born on top of Gorham Mountain in Acadia National Park one rainy day in April 2008. Kerry was hiking 7+ miles and wanted some data on where he was going, what route he should take, the amount of rain he could expect, and the steepness on the western side of Cadillac Mountain. Kerry had his iPhone, but there was neither cell phone coverage nor an app to guide him. Frustrated and alone in the rain in Maine, Chimani was conceived. The outdoors are what we love. It is our passion. But we love technology too! Call it what you will — emerging technology, "gadgets," toys — that's also our passion. 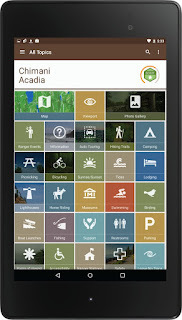 Combine the two and what you have are top-notch apps for exploring and touring the National Parks. We like to think of these apps within the tradition of the telescope or astrolabe of our adventuring ancestors - instruments to help us navigate the natural world (terrain and trails) and provide insight into its workings (the weather, moon phases, tides). All of this information is presented on an intuitive user interface that is visually well designed, includes professionally designed maps, up-to-date and well-researched content, high quality photographs and rock-solid programming. We are proud to have developed an incredible team to build Chimani, and we think you will find the apps useful and a great resource for exploring the outdoors.